It’s imperative, to at least maintain a facade of balance, that a critic must experience things far outside their comfort zone. Reviewing the same or similar things each week just propagates repetition and mires critical responses in a paradigm with small boundaries. Going outside the box and checking out stuff you’re not necessarily into or wouldn’t consider at first glance can provide one of two things – either you discover something so incredibly awesome that you didn’t know you wanted to read until you read it, or you affirm the reason you stayed inside the box in the first place. 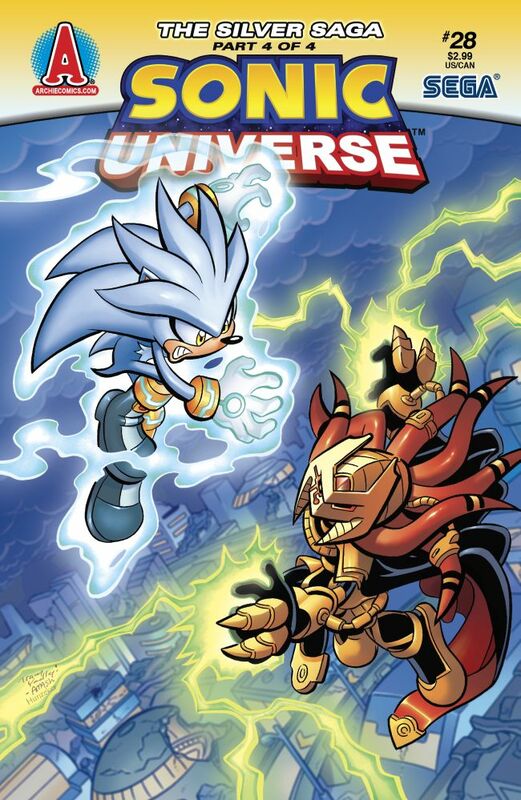 Sonic Universe: The Silver Saga is a reason for me to remain in the box and arm it with machine guns. And maybe also a lava moat. Let me back up a little: the central reason behind exploring a text I would never in a dozen centuries consider reading is owed almost entirely to my housemate, a massive Sonic the Hedgehog fan. He picked this up recently, and sarcastically asked if I’d review. I took it seriously, vowed that I would, made a cup of coffee and had the book completed before I even reached the dregs. Allow me to throw up a disclaimer here. I am not a Sonic fan. I have never really been a Sonic fan. I don’t dislike Sonic, I just never got into it. That means I read The Silver Saga devoid of context regarding past volumes, continuity and characters. So, take my following statements with massive handfuls of salt. The Silver Saga is not a very good book. 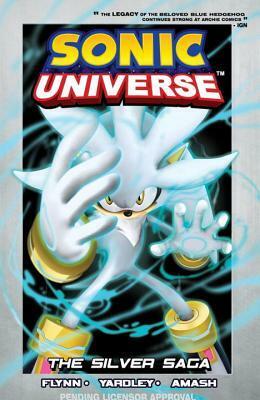 Several hundred years in our future, Silver the Hedgehog – eponymous hero and possibly distant relative of everyone’s favourite blue ball of buzzing Hedgehogian energy – lives in a crapsack world with a tutor who kinda looks like an old Knuckles the Echidna and a master who’s an elephant. He travels back in time to save the world from Enerjak, a demigod with superpowers who’s captured or “de-cored” (read: done what the Dementors in Harry Potter do) all of Earth’s anthropomorphic animal heroes. 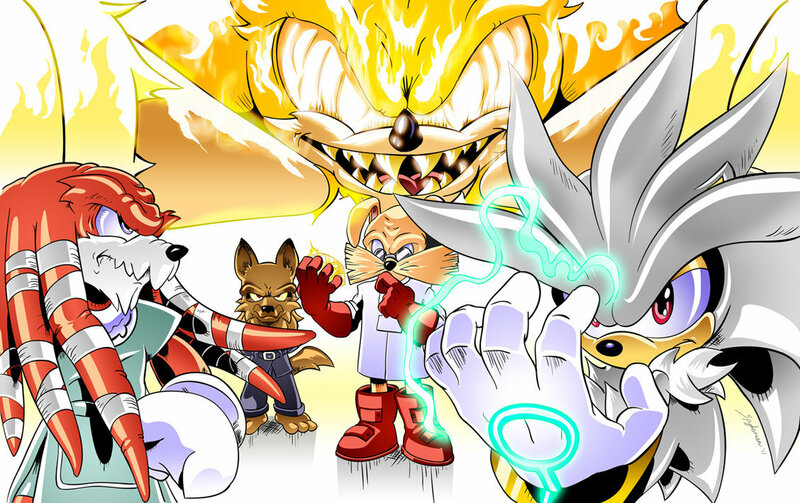 Silver meets with a resistance group that aims to stop Enerjak once and for all. That’s the entire first two-thirds of the story. Seriously. This highlights Silver Saga‘s first problem, which is brevity. The arc is over way too quickly and spends far too much of its pagecount setting things up and introducing a slew of characters who are more one-note than this song. There’s nowhere near enough time to establish any of the cast beyond their colour and a single character trait (i.e. the French one, the sword-swinging one, the big guy, etc), and a lot of their history is reliant on little asides the book makes to previous volumes that I hadn’t read. Which brings us to the second problem with Silver Saga: continuity. Though a few plot points are outlined here and there with context, the majority are left up to those aforementioned footnotes that direct us to purchase more volumes of the comic. Now, as a reader of superhero texts increasingly reliant on prior volumes it feels a little hypocritical of me to condemn Silver Saga for that. Hell, there’s enough elucidation here to at least get a rudimentary understanding of events when compared to the almost complete non-existence of same in a Grant Morrison run that you haven’t read the previous volumes of. In terms of establishing a story that is accessible to new readers, Silver Saga doesn’t hit the mark but does just enough that it’s not a complete wash in terms of comprehension. But comprehension leads us to the third problem with Silver Saga: the title. This is not a “saga” the way, well, Saga is. It’s more like the end of an Avengers movie but with none of the characters properly established, duking it out in a city that gets almost as wrecked as Metropolis once Superman’s done with it. As I said, the story’s over way too quickly once the actual plot gets set up, and it feels like nothing’s terribly achieved once all’s said and done. Maybe an extra few issues would’ve helped? Or possibly some story beats that didn’t rely on exposition from characters we don’t know telling us things we’re never shown? On that note, the fourth problem is dialogue. It’s tepid. Actually, no, tepid is when someone like Cullen Bunn gets involved. This dialogue, written by scribe Ian Flynn, was boring. Tying into the “no characters are rounded” issue, the speechifying in Silver Saga either comes across as forced or overly-simple. 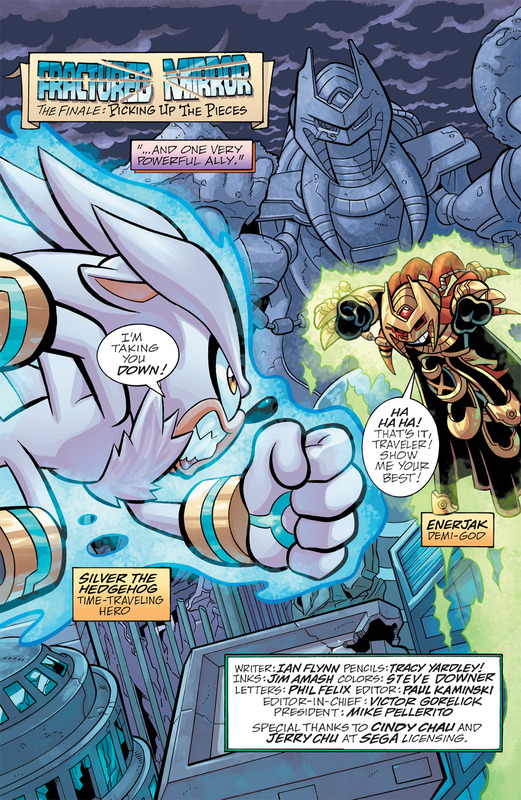 Silver drops the occasional quip the same way Sonic apparently does in some of the latter-day 3D games, and that’s really his only character trait besides his ability to travel through time and look like a polar bear. The members of the resistance have jokes for their respective one-note sandwich boards (for instance, the French one counts in French – how funny is that, guys?!). Enerjak is a hammy, overly-talkative antagonist who doesn’t do much besides tell everyone how screwed they are. I’d say maybe it was intended for kids, but considering what little narrative there is visits some fairly dark places for a Sonic story, I can’t exactly back that claim up. And finally, speaking of dark places, the fifth problem is artwork. Tracy Yardley has these big, cartoonish splash pages all over the place, and that works well for the kind of aesthetic Sonic stories traditionally utilise (going mostly by the games, here). In dialogue moments, that’s fine. In battle scenes, it becomes a miasma of colour. Things are hard to distinguish or interpret without characters overtly bleating about what’s going on in a way that makes Chris Claremont’s X-Men dialogue, which describes battles as they occur on-page in excruciating detail, seem conservative by comparison. Add to that a selection of villains clearly modelled off well-known Sonic characters but recoloured as having lived in the TRON universe, and you’ve got a whole lot of colour and not a whole lot of meaning or weight behind it. If nothing else it’s certainly eye-catching, but in the same way an upturned dinner dish on your carpet catches the eye. Look, it’s clear Sonic stories are not really my bag, and Silver Saga did not ingratiate me towards the property. 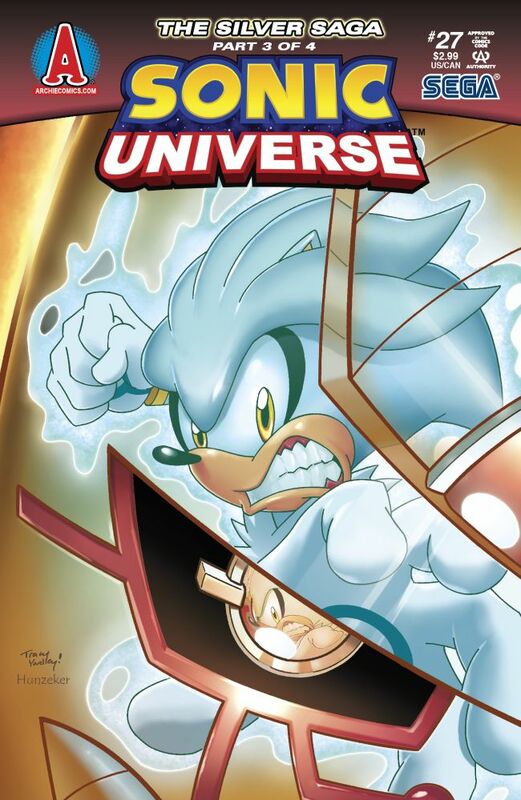 It’s quite possible everything I’ve just mentioned as negative above is exactly what Sonic readers are after, and that the charming simplicity peppered with colour and quippiness is just what they’re looking for when they purchase a volume. As I said at the start of this review, it’s important for critics to branch out from the familiar a little now and then, and while this wasn’t the kind of “Where have you been all my life? !” reaction that I got from checking out weird things like 20th Century Boys and Chew, it was still a worthwhile exercise. I mean, I used to think Captain America and Superman were terrible, and that turned out to be a gross oversimplification. Turns out they’re only bad some of the time. I dunno. If you’ve got Sonic comics you think are the bomb that are great titles for newbies, let me know. Otherwise, something tells me I won’t be back for The Silver Saga 2: Silver Fights Hitler anytime soon.